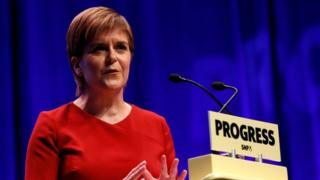 There was a moment in Nicola Sturgeon's policy-rich speech when we moved from the particular to the general. To the philosophical, indeed. She said that the generic question which had moved centre stage was this. "What kind of country do we want to be?" At least one wag in the audience responded: "An independent one!" Ms Sturgeon paused for a moment - although she was not remotely discomfited. As an amendment to the friendly heckle, she suggested that fairness would be handy too. In practice, the audience wanted to hear a version of the old protest chant. "Whaddya we want?" Their answer would be independence. And the next line, "when do we want it?" I expect you can guess what their riposte to that would be. To be clear, Nicola Sturgeon shares their objective. She yearns for Scotland to be independent. But, tactically, she urged them to be patient. Or, more precisely, she sympathised with their impatience. Either way, she wants them to wait. To wait until the shape of Brexit is known. Not because she regards independence as dependent solely upon Brexit. No, the argument is that folk need to know the outline of one constitutional transformation before it would be sensible, strategically, for Ms Sturgeon to present them with another. So the SNP are in a holding pattern on a number of topics. On Brexit. On independence. On events in Catalonia where Ms Sturgeon condemned the EU for failing to condemn the violence of the Spanish police - but stopped short of endorsing Catalan independence. Instead, she again urged talks. And there is a waiting game too on tax. As noted earlier, the speech was policy rich. Affordable housing, child care, the environment, a new not-for-profit energy company, an end to the public sector pay cap. And much, much more. At the same time, of course, Ms Sturgeon is inviting people to elide from devolved policies to the argument that much more could be done under independence. Which brings me back to the question of tax. How are these policies to be funded? Ms Sturgeon, again, was cautious. There would be a debate. Close consideration. Consultation. However, as I disclosed yesterday, ministers are looking seriously at the prospect of varying Scotland's tax bands, not just rates. And the firm expectation is that the overall level of income tax will rise in Scotland.